For one of the most well known landscape photographers in the UK, Charlie Waite has been awfully quiet about his own work for the last decade. 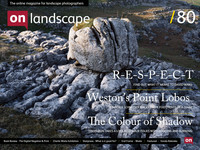 We’ve seen him promoting both his own tour company, Light and Land, and the hugely successful Landscape Photographer of the Year (or Take a View as it’s more formally known) but we only see the occasional new image associated with other events or in his self published book “Arc and Line”. So it was with great interest that on the day I was to visit London for Paul Kenny’s book I had also been invited to the opening of Charlie’s exhibition at the National Theatre. Now a few of us know the National Theatre if we’ve ever been to see the Take a View exhibition. It has various spaces that could be used from quite bijou to rather expansive and I was intrigued to see how and where Charlie’s exhibition would be hung. I was rather pleased to see that the exhibition was in the exactly the same balcony area (the Lyttleton Exhibition Space) as the Take a View exhibition - a huge area for a personal exhibition. If you’ve ever been to an exhibition opening you’ll probably have experienced the strange sensation that the images aren’t the most important items in the room. For one there are usually too many people for the space and secondly most people seen to use it as an opportunity to catch up with friends they haven’t seen for some time; so I was glad I arrived a couple of hours early so I could spend some time with the images undisturbed. In total Charlie is showing 68 images, all of which are printed reasonably large (from 40cm up to 90cm) and framed beautifully in plain black frames for the black and white images and plain wood frames for the colour ones. They are laid out across the whole of the balcony space and, as you can see from the images in this article, leave buckets of room for people to step back and enjoy them. The exhibition can be understood as almost a perfect split between the well known Charlie from Outdoor Photography and his various guide books and the less well known Charlie - those images that have been secretly building whilst he has been working on workshops, advertising campaigns and commissions. If you don’t know much about Charlie Waite you’re in for a treat. Go and buy a copy of these books. A couple are not the best printed books in the world but there are some great insights about landscape photography in them (particularly Seeing and The Making of). The Story of 50 Favourite Photographs is more expensive but worth the money as it’s the most like a monograph. Charlie has a great talent in being able to see subtleties of composition that evade many other photographers. His pictures have an insouciant perfection that is beguiling and I think it’s fair to say that he has rightly earned his place as one of the masters of the square photograph. I’ve included a few of Charlies images in this article, four of which from “Charles I” as it were - the images you may recognise well - and four from “Charles II” - those that you may not have seen. This is an exquisite example of Charlie’s understanding of the use of light and shade in composition. The ‘bowl’ itself has been used to great effect within the square bounds of the image but it is the large shadow on the left hand side and the distant landscape under a pall of dark cloud that balances the composition. As Charlie says in 50 Favourite Photographs, “Everything is curved and rhythmic in this photograph. Scoops, s-shapes, swells and softness.” I couldn’t agree more. This particular image is one that doesn’t have as much of the obvious hand of the photographer in it but never-the-less it is one that I keep coming back to. I think it’s the caster sugar dusting of frost that evens out the tones in the whole image until the only focal point is the building. Even the path, which looks like it runs out of the image to the left, is linked to the shed via the bright hole in the fence - the end of the path, the hole and the building itself a rhythmic triplet of light all leading to that wonderful orange and green roof; the orange repeated in the leaves of the frosty trees and scattered across the road, the green repeated in the grasses and bushes. I don’t think there is a person around who hasn’t seen this image and had the impulse to find their own hay bales to work with; and probably not a one of those that came away with anything as perfect as this. One of my personal favourite images and, as you’ll find out later, the unexpected favourite of one of our writers. A favourite aspect of this picture is the way the straw in the bottom left leads to the first bale and suggests a movement and energy that works opposite to the flow in the clouds. How many times has this boathouse been photographed I wonder? Sitting on the edge of the main road from Windermere and Ambleside to Keswick and yards from a car park it has seen many a tripod; and yet I doubt there is more than a small handful as well balanced and with such exquisite light as this. The warmed purple and brown tones of the now extinct Kodachrome 64 accentuate the hazy late summer light and the ripples from the passing ducks adding a catch light below the shed, all taken from Charlie’s signature step ladder giving the image a little added three dimensionality. I’m obviously seeing Charlie’s newer work for the first time in this exhibition (well - most of it) and as usual there is an element of uncertainty about some of it. Just like the music you heard while growing up, the images you saw when you started photography will connect with you in a stronger way than newer images. However, the modern work is edited from a quieter time in Charlie’s photographic career and it would be unfair to compare it with the best of his work taken over a much longer period whilst he was photographing full time. Given these caveats it sounds like I’m going to be dismissive of Charlie’s new work but I’m not. It’s fair to say there are images included that I wouldn’t have selected but on the whole the work stands very well alongside the earlier work. The unbiased observer would be hard pressed to separate the two I think. Contrary my usual preferences I particularly liked Charlie’s architectural work, especially that of the adobe or rustic buildings. They allow Charlie’s eye for tone to shine through. The later colour landscape work in general does not work as well for me although there are obviously exceptions - in particular moments such as this version Damme II below where Charlie has constructed a beautiful arrangement of elements and had the patience to wait for the perfect ‘Bresson’esque focal point to arrive. From the same location Charlie produces a softer exposure of reeds and avenues of trees - both favourite subjects. Charlie’s black and white work hasn’t had as much attention as his colour work. Apart from the occasional ‘star’ image, the work has been secluded in his “In My Mind’s Eye” book. Most of the images here are contained in this essential purchase but there are a few exceptions - particularly Sahara, Libya (below) and this wonderful conical Italian church in storm lighting. The reed huts in this image remind me of one of Charlie’s pet bugbears - don’t break the horizon! His caption comments on the struggles to get the camera high enough to bring the point on the hut on the right tucked just inside and over the small shadow. The exhibition is a must see. Charlie has more than earned his place in the ‘masters’ of landscape photography and despite his insecurities about his work he continues to add wonderful images to an already stunning portfolio. Even if you can’t make it I would highly recommend the catalog of the exhibition - it is better printed than some of Charlie’s books and contains all of the images at a reasonable size (the smallest at 3 up on an A4 page). If you can make it down put aside some time to let the images sink in - I spent a very pleasurable two hours with the images and would happily return for another look. The exhibition continues until at least the end of September (perhaps later) and if you can make it on the 6th or 19th of August you can have a guided tour of the exhibition with the man himself for a small fee. Click here for more information or here for info about the exhibition in general. I've just been told about a video introduction to the exhibition that is on the Vimeo sharing website - take a look by clicking here.